UFC 236 provided two incredible fights on Saturday night at State Farm Arena in Atlanta. First, Israel Adesanya claimed the interim middleweight belt, beating Kelvin Gastelum by unanimous decision by scores of 48-46 on all three judges’ cards. That bout, which was even on the scorecards heading into the fifth round, left fans wondering how the second fight of the night could possibly live up to the first. Yet Dustin Poirier and Max Holloway delivered. Poirier snapped Holloway’s 13-fight win streak and won by unanimous decision with a score of 49-46 on all three cards in the main event of the night, winning the interim lightweight champion title. 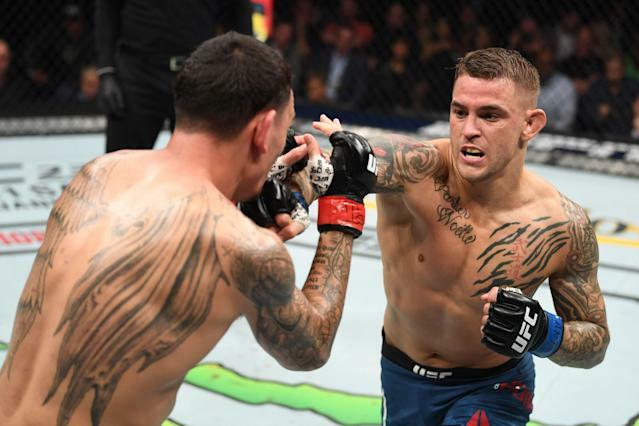 The win also earned Poirier a unification bout with current champion Khabib Nurmagomedov, who was watching along on Saturday night and said he had the fight scored as a draw. Still, he sent his congratulations to Poirier and hinted ahead at their upcoming unification bout this fall. When it was all said and done, UFC fighters and fans from across the world took to social media to share their excitement after watching one of the best cards of the year. Wow for these #ufc236 double headers title fights! That's one of the greatest UFC title fights we've ever seen.